This producer not only boasts the highest winery in Europe at 1140 metres, but also the highest altitude vineyards at over 1400 metres. The views from their estate are correspondingly spectacular. 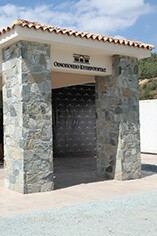 Kyperounda are situated in the Pitsilia range of the Troodos Mountains and are owned by more than 40 shareholders. These include the developed distribution networks and winemaking expertise of the Photiades Group and the Greek winemaker Boutaris. Kyperounda also enjoys the increasingly celebrated ability of their winemaker, Minas Mina. Owing to their high altitude, Kyperounda invariably harvests at least a month later than vineyards at half their elevation. They grow Cabernet Sauvignon, Merlot, Syrah, Chardonnay and Gewürztraminer, as well as an excellent wine made from the principal native white grape, Xynisteri. Additionally, Kyperounda also produce a Commandaria. This wine is made from Xynisteri and the local black grape, Mavro, grown, fermented and initially aged in the Commandaria region before further maturation at the Kyperounda winery itself. Kyperounda’s cellar holds more than two hundred and fifty 225 litre French oak barrels and their production capacity is approximately 200,000 bottles. Commandaria represents an ancient wine style, possibly the most ancient wine still in production, and is documented in Cyprus as far back as 800 BC and mentioned by writers such as Hesiod. Until the appellation of Commandaria was created in the late 12th century, this style of wine was referred to as Nama and was considered a holy wine. During the 3rd crusade Commandaria was served at the wedding of King Richard the Lionheart of England to Berengaria of Navarre. Richard had recently conquered the island’s strongholds form the Byzantine renegade, Isaac Comnenos, and subsequently sold Cyprus to the Knight’s Templar. They defaulted on the full payment and he then sold it to Guy de Lusignan, King of Jerusalem. However, the Knight’s Templar continued to keep a feudal estate at Kolossi, and this became known as La Grande Commanderie, reflecting its status as a military and trade headquarters. Following the Templar’s suppression, their lands were sold to the Knights Hospitaller. Later that century, King Philip of France held a wine competition dubbed the Battle of the Wines. The winning wine was believed to have been Commandaria, sealing the wine’s reputation until the Turkish conquest of the island in 1570/71. Traditionally Commandaria was unfortified. 20th century examples of mass-market quality were (and still are) fortified. There exists a resurgent unfortified style amongst those smaller growers intent on raising wine quality. It is obligatory for the grapes destined for Commandaria (Xynisteri and Mavro) to be grown in the PDO Commandaria region in the foothills of the Troodos mountains. The wine must also be made within the confines of the region but may, with the right permission, be matured elsewhere on the island. Kyperounda produces an exceptional example of an unfortified Commandaria from 85% Xynisteri (white) and 15% Mavro (black). Fully mature grapes (with a potential alcohol of 25% abv) are dried in the sun for 12 days. This shrivels them, reducing the aqueous content of the grapes. It also markedly concentrates sugars, flavour compounds and acids. A slow, cool fermentation follows in stainless steel tanks. The wine is matured in used 225 litre French oak barrels (formerly used to mature their Chardonnay and Petritis Xynisteri) for six years.